I like the Left Business Observer. I think that its well written, quite amusing and sometimes provides interesting arguments and data-points that I would otherwise have missed. It is also generally up to scratch on economics, although some of the more Marxian commentary is not to my taste. However, one issue (#136) has, so far as I can see, laid out a really bizarre (one might say “neoclassical") argument. On page 4 Henwood (the author) tries to make a case against right-wing lunatics who claim that there has been no austerity in Europe. He’s right to make this case as there has been substantial austerity in Europe as can be attested to by the high unemployment and low growth rates. But the right-wing nutters point to the fact that the budget deficits have not come down all that substantially in many countries. The honest way to evaluate fiscal policy over time is by adjusting for the state of the business cycle: that is, what would the current structure of revenue and spending look like if the economy were at some approximation of “full employment"? That allows you to isolate the active effects of policy, and separate them from passive changes in revenue and spending that simply reflects ups and downs in the economic cycle. Okay, let’s run through a few things here. Potential GDP is basically a projection of what GDP would be had a recession not taken place. 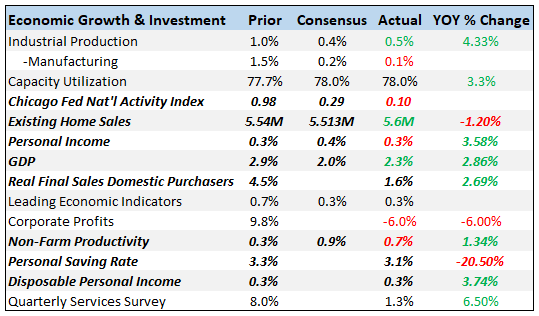 It assumes that GDP growth would have followed trend. The cyclical budget deficit is a calculation of the budget deficit based on the supposition that consumer spending and tax revenues had not fallen. From what I can tell the latter is based on fairly dodgy calculations, but let’s not get into that here. So, what is Henwood’s graph showing us? Well, it is showing us what the budget deficit would be if the economy had not fallen off a cliff and had continued on in some sort of unchanging but growing state. The problem with such a presentation? Well, the economy did indeed fall off a cliff. In that case, what is Henwood’s presentation telling us about the austerity in Europe: all of nothing. You cannot simply abstract away from a massive recession and say: “this is what would have happened to the government budget without the recession". Why? Because how on earth does Henwood or anyone else know this? Do they have access to a multi-dimensional gate where they know precisely what the future would have been in an alternate reality? I somehow doubt it. What Henwood is doing is engaging in a classic error well-known to Post-Keynesians: he is assuming that economic data is ergodic and that the future mirrors the past. Well, it doesn’t. 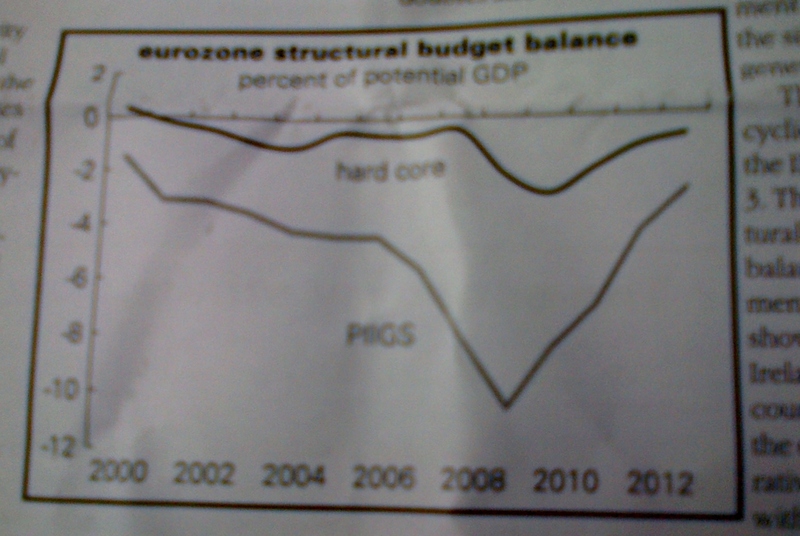 I don’t want to get too deep into the methodology here as it becomes complex very quickly, but think about this for a moment: Henwood’s graph shows that between 2007 and 2008 the structural budget balance of the PIIGS as a percentage of potential GDP almost doubled in size. But he claims that his measure irons out any endogenous change that occurred due to the recession. Does this mean that we should conclude that the PIIGS governments made a conscious decision to massively increase government expenditure in this period? Or is it more reasonable to assume that Henwood’s measure is not picking up what he thinks it is picking up? I’m going to opt for the latter. In fact, this leads me to wonder if some of this huge increase is due to bank bailouts in the likes of Ireland. If this is the case then why are these not abstracted from out of Henwood’s measure? After all, these were not discretionary increases in government spending in the normal sense of the term and thus should not be included since Henwood wants to get to grips with the level of discretionary government spending relative to taxation; that is, in his language, “the active effects of policy" and not “passive changes in revenue and spending that simply reflect ups and downs in the economic cycle". My reckoning is that you should count the bailouts in the latter. No, the entire presentation is based on a variety of unstated assumptions that, when scrutinised, appear completely dubious. History happened the way it happened. To engage in such “what if" scenarios is discredited in historical studies as it is recognised for the fiction that it is, so why should it be permitted in economics? If you want to see how much austerity has been undertaken by various governments you go and find the data on how much expenditure has been slashed and how much taxes have been increased (regardless of whether or not such tax increases generated the intended revenue as an austere government has no discretionary power over this). These flashy “alternate reality" measures of austerity will only lead to trouble and confusion. Let’s the better of us not start mimicking the neoclassicals, shall we? Previous Is The Labor Market Running Out Of Supply?